This "Historically Speaking" column appeared in the Exeter News-Letter on Friday, September 28, 2012. The first newspaper published in Exeter was called The New Hampshire Gazette or Exeter Morning Chronicle. Its first editor was an infamous character named Robert Luist Fowle, who moved to Exeter in 1776 from Portsmouth to escape the radical politics of his uncle, Daniel Fowle. 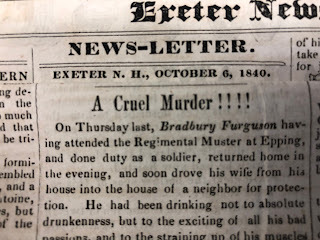 In Exeter, Fowle managed to publish his newspaper without troubling the local patriots and won their confidence enough to receive some official printing jobs. Historian Charles Bell wrote of the subsequent events, “he was discreet enough to gain the confidence of the leading men in the popular movement, so that he was at length employed in the delicate and confidential business of printing the bills of credit for the State. It was not long before counterfeits were discovered, of these, and of the similar paper currency of other States, and suspicion arose, from various circumstances, that Fowle was concerned in issuing the spurious bills.” Fowle was arrested but escaped from the Exeter jail and found his way to the British lines. After the war, he returned to Exeter but not in the capacity of a printer. The printing industry, however, took off after the war. A series of newspapers were published in town and by the early 1800s, books were being produced. Henry Ranlet opened his print shop in 1785 and began printing books for out of state booksellers. Ranlet was one of the first local printers to publish music – a type of printing only undertaken by a skillful printer. After Ranlet’s death in 1807, his print shop was dormant until purchased in 1818 by brothers John and Benjamin Williams of Exeter. John was a trained printer and Benjamin was a bookbinder. They set up shop and then had two fine houses, nearly identical, built for themselves. John lived in the house at 80 Front Street, which today is well-known as the setting for John Irving’s A Prayer for Owen Meany. Benjamin lived off Center Street in a house that sits across the parking lot from the American Independence Museum. The Williams brothers produced a wider variety of books than did Ranlet. 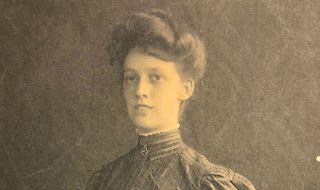 Bell describes the output as, “some were books of sterling value, and put forth in handsome style; perhaps a greater number were novels and tales.” Novels were viewed quite unfavorably at the time, so this was no great compliment from Mr. Bell. In 1831 the print shop of J & B Williams was visited by a reporter for the Exeter News-Letter who walked away soundly impressed. “We believe that few of our townsmen are aware of the extensive business which is effected at this establishment.” The Williams brothers were producing 250,000 ‘handsomely bound’ volumes annually, including 10,000 copies of Scott’s Napoleon. They also sold blank and ruled books for general and merchant use. 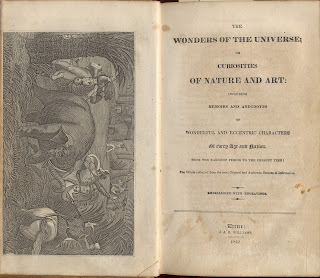 After John J. William’s death in 1845, the publishing industry in Exeter began to wane. Textile and shoe factories became the driving economy. But Exeter’s ‘passion for reading’ did not disappear. Private lending libraries flourished and the Exeter Public Library – free to all citizens – opened in 1853. Our voracious appetite for reading continues today, although some of it is done on electronic readers. Although the printing industry is dealing with its own commercial transitions, reading, whether on the page or the screen, still captures our imagination. Imprint of J & B Williams printers of Exeter, NH. The Williams Brothers produced thousands of publications between the years of 1818 and 1845. This particular book, published in 1842, was a collection of strange tales including “The Murderous Barber; Or, Terrific Story of the Rue de la Harpe at Paris” and “An Atrocious and Shocking Murder by a French Clergyman.” Although Charles Bell referred to such titles derisively as “novels and tales” they were not restricted from Exeter’s reading public.